5 Bedroom Detached Bungalow For Sale in Penzance for Asking Price £750,000. Fantastic opportunity to create a family home with a holiday let for income, or the option to build a second home for relatives within the gardens. This property must be seen to appreciate the location, views and accommodation. A long driveway draws you towards the property positioned at the rear of the large gardens along with a spacious parking area. The main entrance takes you into a stunning sun lounge spanning the width of the property. There is a wonderful Italian Terrazzo floor plus large windows and double doors providing fabulous views across the gardens to the sea beyond. A unique feature to the sun lounge are doors that lead to the kitchen, hall, sitting room and also the master ground floor bedroom, wonderful all year round and in the summer allowing the sun to heat the property. Starting with the large kitchen and dining area, a bright room fitted with hand crafted country style kitchen with a feature electric AGA, electric oven plus a 2 ring ceramic hob. There is also an integrated fridge freezer, dishwasher plus a butler's style sink. Other features include the circular breakfast bar, tall larder and oak flooring throughout, a truly lovely room. Moving through the property brings you to the sitting room again full of light and air with the doors open out to the sun lounge. The feature open fire place and wood flooring creates the warm feeling perfect for winter nights. The large L shaped hall runs through the property and provides access to a number of other rooms on the ground floor. With oak flooring and a splendid feature staircase rising to the first floor. Set at the rear of the property is a spacious utility room fitted with a second superb Italian Terrazzo floor plus a variety of cupboards, space for appliances and a walk-in storage cupboard which also houses the solar panel controls. The central heating boiler is also located in this room, plus a rear access to a conservatory and door through to the kitchen. Along the hall is a family bathroom serving the two double bedrooms. This is fitted with a suit including a corner bath and a separate tiled shower. Located to the opposite end of the property are two large double bedrooms both with double aspect windows with the master bedroom facing the front and having the double doors that open to the sun lounge, a super feature to take in the stunning sea view or gardens. To the first floor are three bedrooms all having views either to the gardens, fields to the rear or sea to the front. The largest of the rooms a double bedroom which makes an ideal guest room with eve storage and a separate wc. Across the landing are a fitted family bathroom and an extra feature of a fitted timber sauna. Within the gardens is a fantastic detached annex with a modern fitted kitchen, open plan dining and sitting room which has slate tiled flooring and under floor heating. There are plenty of windows allowing in the sun light making the annex an ideal studio or office space. There is also a double bedroom with a separate shower and wc. The bedroom also has under floor heating. The annex is not Council Tax rated and offers the potential for holiday letting or family living. Externally there is an area that can be used to create a private garden. The gardens are also a major feature to this property and measuring approximately 1.15 acres. The spacious gardens surround the property with large lawn areas divided with a variety of exotic shrubs, trees, hedging and flower beds. To the front of the property is a fantastic raised terraced seating area capturing the sun and panoramic sea views. Towards the rear of the property is a super vegetable area with green house and shed. The parking area gives plenty of parking for up to 3 cars plus a 2 car timber carport, workshops plus an additional 4 parking spaces. An extra feature to this property is the outline planning permission for a single story detached property that can be built within the front section of the garden. This could also be used for holiday let income or additional family living. 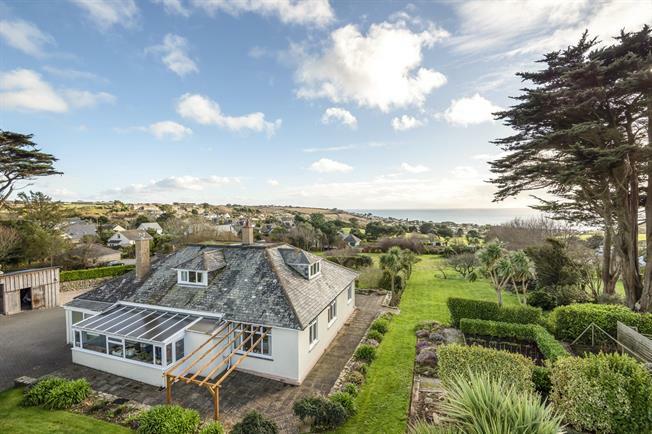 The property is positioned on the outer edge of the village of Praa Sands approximately half way between the towns popular Towns of Penzance and Helston. There is a variety of shops, supermarkets, schools and amenities. The main feature is the sandy beach of Praa Sands which stretches for about a mile between Hoe Point in the west and Rinsey Head in the east. In the summer the beach is a popular family tourist destination. Facilities close to the beach include a pub/cafe right on the beach front, plus a general stores, surf shop and a golf club. There is also a fuel station a short distance away and a bus stop for Penzance and Helston.